Yard long beans or field beans are also called as Chinese long beans. In India it is called as Lobiya, Barbati, Boda, Bodi etc in different languages. There are many more names in other languages you can see here. 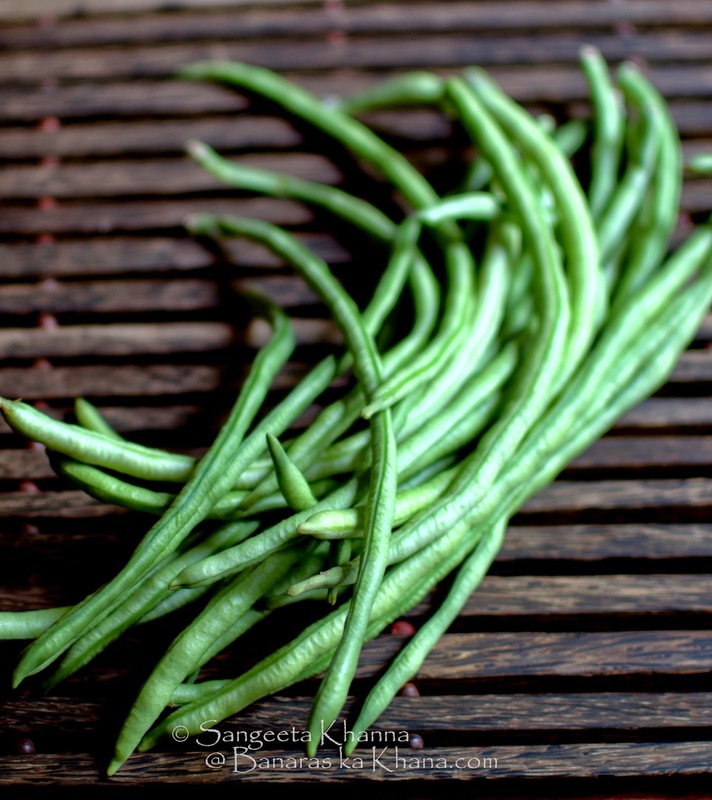 In north India it is a summer season bean along with Guar (cluster beans). I find these beans quite easy to work with. Just snap the ends and gather a bundle together and shop them all in whatever size you want. I remember my grandmother and mom both used to snap the beans in small bits by hands, one by one while talking to each other or watching TV. It used to take a long time and somehow when I started cooking lost interest in lobiya. But then we planted some lobiya in our garden one season and a beautiful crop made me love this vegetable once again. I remember the first time I had cooked it for a few vegetarian guests from Arvind's family and I was clueless how to cook it without onion and garlic as these were elderly people who didn't eat any onion and garlic. In such times I always thought of how the kachori walas of Banaras cooked the simple jain style subzi they served and followed my instincts, the result was always encouraging. That day too those old people praised the curry so much I almost thought it was because of the garden fresh beans. 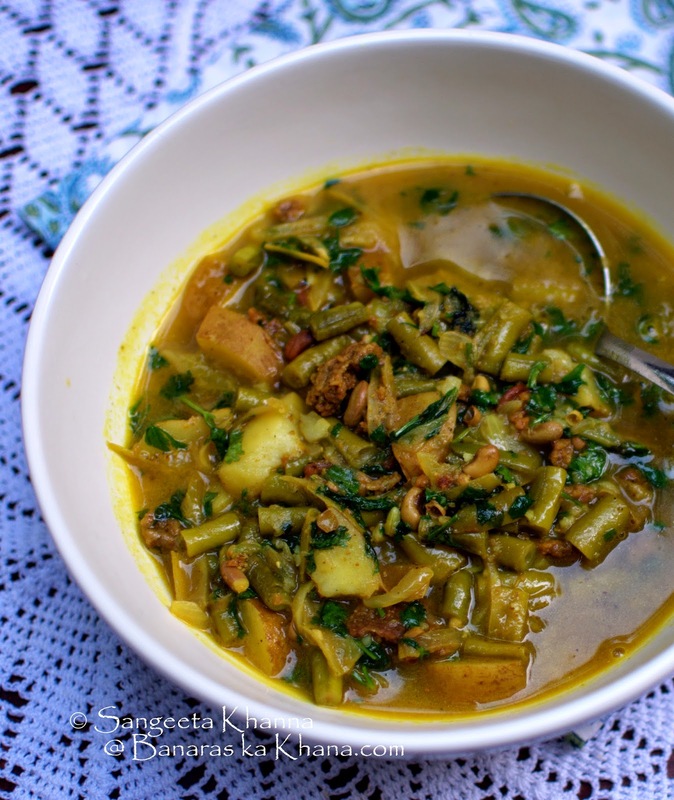 Later when I recreated the recipe even I loved it and that became my favourite way to cook lobiya. Will share that recipe sometime soon. 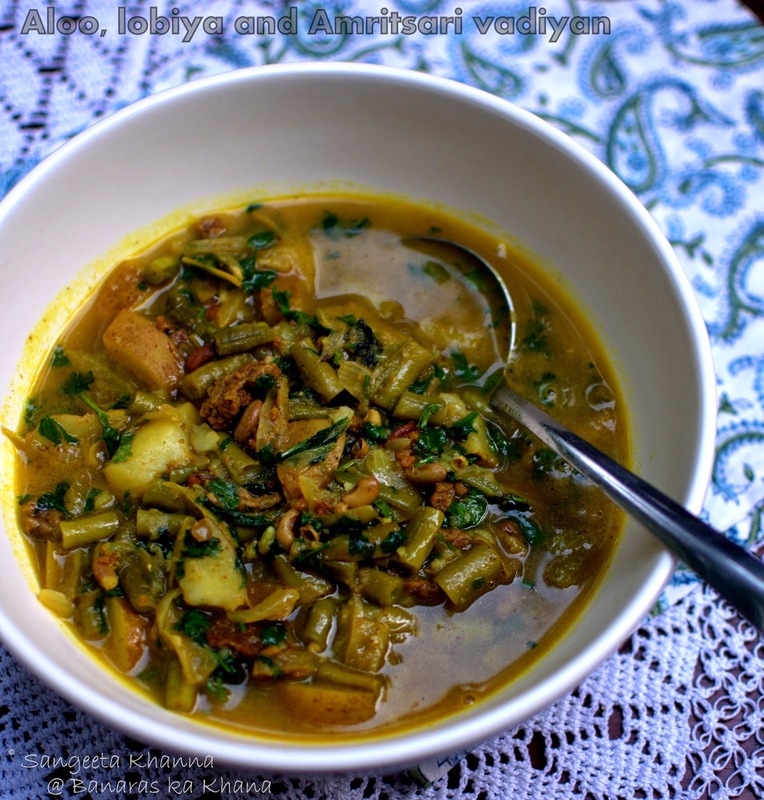 This alu lobiya with amritsari vadiyan is another favourite of mine. 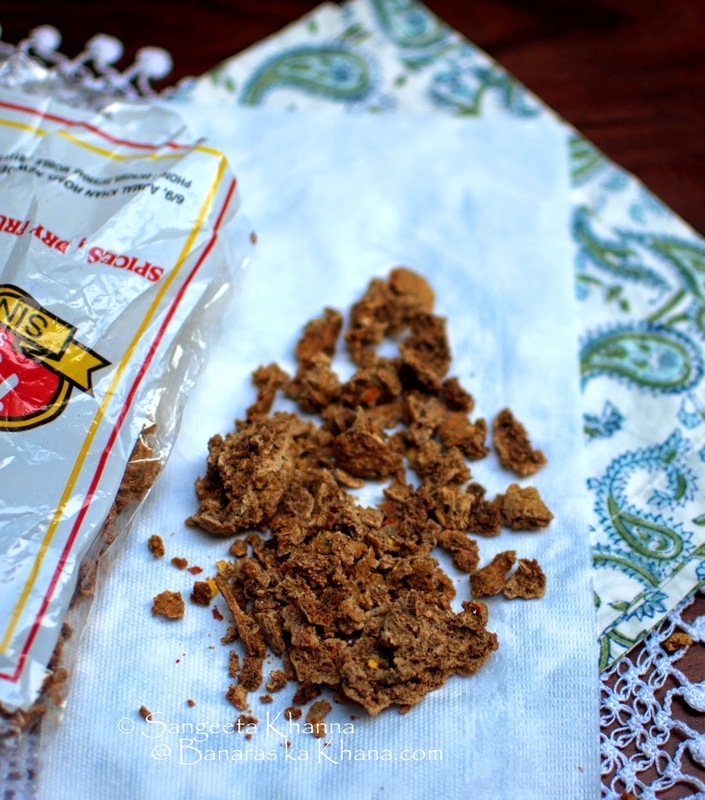 Vadiyan (plural) are sun dried spice lentil cakes that are made in the shape of small cookies. The vadiyan impart the flavours of spices and a very distinct flavour of the dehydrated lentil paste that I consider Indian Umami. It livens up any curry in my opinion and I often crave for it. I have never tried making vadiyan of my own because it takes some time for a few days to prepare the spices and lentils and then shape them on a sheet and then sun dry them for a week or so. But I am planning to do so some time. I buy them from Rupak stores and sometimes my mum gifts me some of her home made stock. These are from Rupak and look crushed. I prefer using them crushed so it doesn;t matter if they are not whole. Lobiya is chopped like this. I often store it in a ziplock bag for a couple of days if my maid has chopped too many vegetables for my comfort. We don;t use any spices in any curry that uses vadiyan. The spices in the vadiyan is enough to spice up the curry and bring an unmistakable Umami flavour in the curry. Heat the oil in a kadhai and tip in the vadiyan. Fry till they become aromatic. My mom used to take the fried vadiyan out and proceed with the vegetables but I let them be in the kadhai as I add on the vegetables. Add the sliced onions as soon as the vadiyan get fragrant. Fry till the onions get a bit caramelized. Add the chopped lobiya and potatoes and fry them all for about 4-5 minutes. Add turmeric powder and mix well. Add 2 cups of water, mix well and cover the kadhai to simmer the curry for about 10 minutes. Check once, mash some of the potatoes and let it come to a desired consistency. Some people like to add a little tomato puree at this time but I prefer it without the tomatoes. Add chopped dhaniya patta and serve hot or even at room temperature. I summers we don;t care about hot food. The vadiyan in the curry soak the water and get softer. The curry gets a really unique flavour due to vadiyan, you have to eat it to believe it. 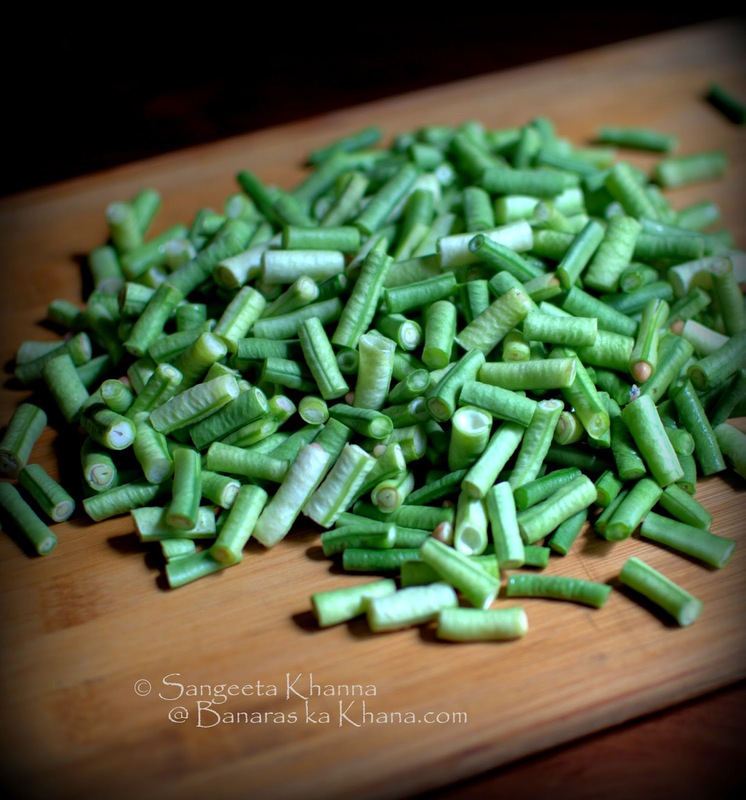 See this pyaz vadiyon ki subzi and you would know how only the vadiyan are capable to make a curry flavourful. It has been ages since I have had a vadiyaan curry! I used to cook it with only potato in a rather watery curry of onion and tomato. I will try it with lobia beans too. Its good to have various combinations of the everyday ingredients.